Goedknegt, M. A., Thieltges, D. W., van der Meer, J., Wegner, K. M., Luttikhuizen, P. C.
Despite their frequent occurrence and strong impacts on native biota, biological invasions can long remain undetected. One reason for this is that an invasive species can be morphologically similar to either native species or introduced species previously established in the same region, and thus be subject to mistaken identification. One recent case involves congeneric invasive parasites, copepods that now infect bivalve hosts along European Atlantic coasts, after having been introduced independently first from the Mediterranean Sea (Mytilicola intestinalis Steuer, 1902) and later from Japan (Mytilicola orientalis Mori, 1935). At least one report on M. intestinalis may have actually concerned M. orientalis, and M. orientalis thus qualifies as a ‘cryptic invader’. 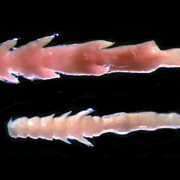 Because these two parasitic copepods are morphologically similar, knowledge about their distribution, impact and interactions depends crucially on reliable species identification. In this study, we evaluated the reliability of morphological identification of these two species in parts of their invasive range in Europe (Dutch Delta and Wadden Sea) in comparison with molecular methods of well-established accuracy based on COI gene sequences and ITS1 restriction fragment length polymorphism. Based on seven easily measured or scored macro-morphological variables that were recorded for 182 individual copepods isolated from blue mussels (Mytilus edulis Linnaeus, 1758), a principal component analysis showed two relatively distinct but overlapping morphological species groups for females, but no clear separation in males. Discriminant function analysis showed that the females can be discriminated reasonably well based on some of the morphological characteristics (identification error rate of 7%) while males cannot (error rate of 25%). The direction of the dorsolateral thoracic protuberances was identified as the most important trait for species discrimination, but among the morphological features checked, none could flawlessly discriminate between both species. We recommend the use of molecular techniques in future studies of invasive Mytilicola to reliably discriminate between the species. The morphological similarity of these two invaders suggests a more general problem of cryptic invasions and compromised identification of parasites in invaded ecosystems. This problem should be borne in mind whenever invasive parasites are investigated. Texelse Courant I won a VLIZ Award!